The ‘Jack Gear Invitational’ is an FMB (Freeride Mountain Bike World Tour) event that takes place across the festival weekend on a custom built track, set within the wooded grounds of Leopallooza in Cornwall, United Kingdom. The tour visits countries including Sweden, Hungary, Spain, Canada,Ukraine, Croatia and the US. Now Leopallooza has been added to the list. The project involved producing a series of different 3D visualisation designs to showcase the course to potential sponsors. Some of these designs are shown below. 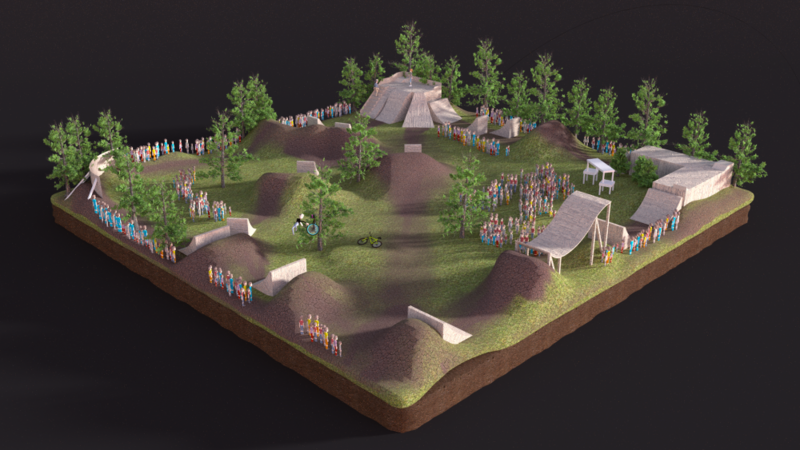 A 3D flyover animation of the course was also created to promote the event itself at Leopallooza in Cornwall. This was a fantastic project to have been involved with and I can’t wait to see what these guys do next! When I wanted to launch my digital newsletter I needed a new website to do it justice. I approached Dean because he has always looked after my other websites in an efficient and timely manner. After a detailed brief he put together a basic design, which completely captured the feel of the site, and it went from there. With further consultation the site grew and the vision became a reality and I am now proud to be able to launch my newsletter off the back of a stylish and well-designed website. Dean also offers ongoing support which is vital to a business such as mine.